Lighting consumption constitutes about 30% of residential consumption as per a study by Ministry of Environment and Forest in India. Its contribution in your electricity bill may vary from 10-20% depending on your total bill. Although it may not be a major contributor in the electricity bill, the energy efficient options are fairly simpler to implement and provide higher rate of returns. 1) Incandescent Bulbs: The traditional yellow light bulbs which were available in various variants: 40W, 60W and 100W, are the most inefficient in terms of energy consumption. 90% of the energy they consume is lost as heat and only 10% is converted into useful light. Although they are still quite inexpensive (Rs 10/-) and a lot of households still use it, but they are the energy guzzlers. Many countries in the world have stopped producing them. Even if they are still there in working condition in several households, it makes a lot of sense to replace them with energy efficient options just from a cost saving perspective. 2) Tubelights: The fluorescent lamps are better than Incandescent bulbs (50-70% better in providing same amount of light) and they have been there in the market since quite some time. It started coming in the form of tubelights (something which most of us have known since our childhood) and later graduated to come in form of CFLs. A typical fluorescent lamp has a ballast (to stabilize the current through the lamp) and a tube. In past tubelights used to come with electromagnetic ballast which caused the lights to flicker on start. Now a days we get electronic ballast which prevents the fluorescent lamps to flicker. Electromagnetic ballast consumes for electricity than an electronic ballast. Most tubelights today have electronic ballast. Tubelights are also available in various variants: T12, T8 and T5. These numbers represent the thickness of the tubelight. The smaller the number, the higher the efficiency. T5 tubelights with electronic ballast are the best available fluorescent tubelight options in the market. A T12 tubelight with a electromagnetic ballast typically consumes 55W of electricity but a T5 with electronic ballast will consume only 28W of electricity (comparison is for a 4 feet tubelight). Thus a T5 provides about 50% electricity saving over a regular T12 tubelight. 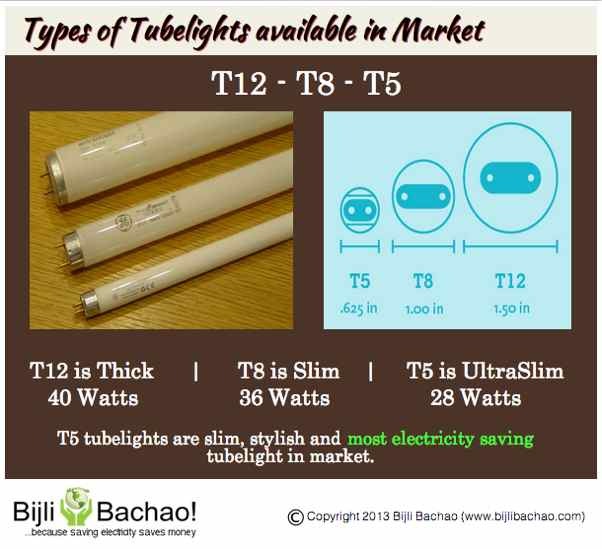 T8s are typically 38W tubelights and are better than T12s. Although T5s are little expensive, the payback is within a year. Also their life is quite good and they last for 3-4 years at least. Many companies give 1-2 year replacement warranty on T5s. Thus the payback happens within the warranty period. 3) CFLs: CFLs have been regarded as the best energy saving option in our country since quite some time. CFL is a variant of fluorescent lamps (or tubelights) but has a different application. CFLs act as a point source of light (light originating from one point) whereas tubelights are line source (tubelights have bigger lengths) and thus the area covered by tubelights is lot more than that of CFLs. 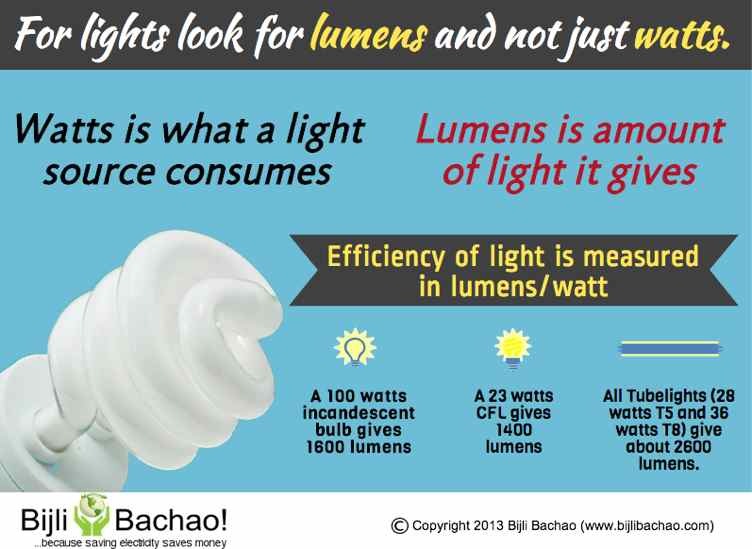 This is the reason why a lot of people feel that CFLs produce lesser lights than tubelights. Even with equal wattage (2x14W CFLs) the amount of light is felt lesser than a T5 tubelight (of 28W) because of CFL being point source. CFLs being compact in size provide options to create smaller (lower wattage) bulbs that can cater to locations where tubelights provide extra brightness (more than required). CFLs provide up to 70% energy savings over a typical incandescent bulb. Although a little more expensive than a incandescent, payback happens within a year. 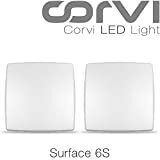 4) LEDs: LEDs are the latest and most efficient lighting option which is available in the market. Their electricity consumption is 50% less than that of CFLs and fluorescent lamps for the same amount of light. 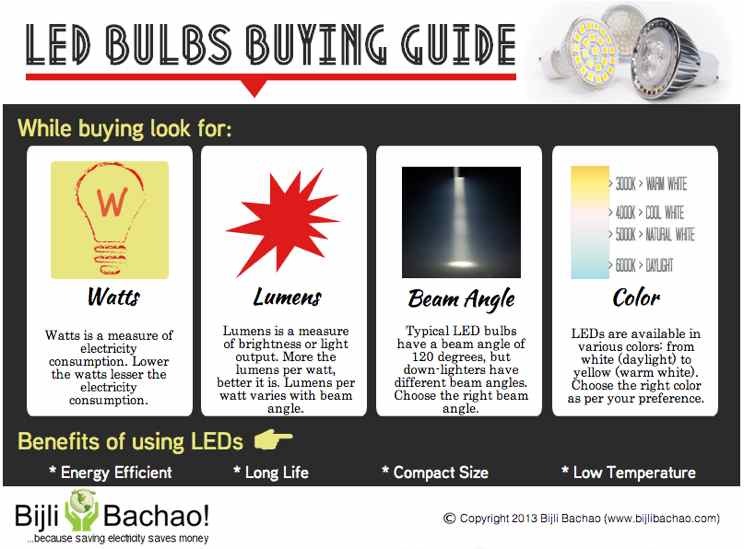 LEDs also are long lasting with a life of about 10-25 years and their performance remains the same throughout their lifetime (Tubelights and CFLs get dim with time). Although a little expensive (with a payback of about 2 years), the benefit with LEDs is that it is maintenance free. Once installed, it will not need any repair of change for at least 10 years. A lot of companies manufacturing LED options give replacement warranty for up to 10 years which makes the option even more attractive. The only drawback of LEDs is the angle covered by the light. CFLs and tubelights provide lights in 360o where as for LEDs the angle depends on the kind of reflectors used in the bulb. Some do provide larger angles so that is something that should be checked before buying. Wattage of the bulb or tubelight has been traditionally used as the measure of amount of light produced by it, but watts does not represent the actual amount of light produced. The amount of light produced is represented by a term called lumen. So to compare two lights, one should compare the lumen of output and the angle of delivery of light. Wattage just helps one estimate the power consumption.